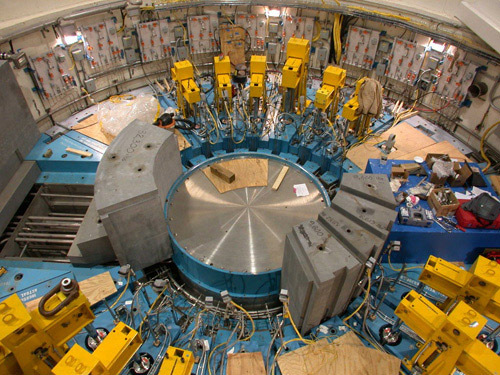 Safety Catchers Prevent Gravity Fall of Equipment | Advanced Machine & Engineering Co.
One of the shutter rooms on the SNS (Spallation Neutron Source) at Oak Ridge National Laboratory (ORNL). Overall, a series of 30T and 50T shutters is utilized for neutron control function. Each shutter has two safety catchers in place. This neutron delivery system consists of eighteen 30T and 50T shutters, raised and lowered vertically, 20T and 30T respectively, by stainless steel hydraulic cylinders. The cylinders operate on tap water at 2200 psi that is continuously filtered and sterilized. The shutters lower by gravity controlled by metered outflow controls. This operation can occur four times every hour for approximately 5000 hours annually. The SNS is currently utilized for advanced R&D and materials development in various markets, including semiconductor, medicine, and materials engineering. It will be the most intense and powerful neutron beam source in the world when it achieves full power of 1.4MW. As ORNL engineer Ken Chipley explained, "We investigated a number of solutions to solve the shutter operation challenge, working with Dave Vesco and his team at TPG Application Technology in Knoxville, a company that specializes in the engineering of remote operation and robotic systems used in radioactive and other hazardous areas. 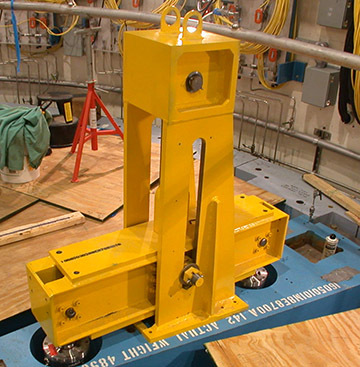 One of the shutter bridge cross beam mechanisms with two SITEMA Safety Catchers; shutter in up (closed) position; Advanced Machine & Engineering supplied the 80mm and 100mm drive rods, as well as the shutter bridge cross beam lift mechanisms and lift towers for the application. "After reviewing several options for the shutter operation integrity, we decided on safety catchers for the drive rods." Each shutter drive cylinder is equipped with two SITEMA Safety Catchers, supplied by Advanced Machine & Engineering Co. (AME) in Rockford, Illinois. SITEMA Safety Catchers are typically utilized for equipment and personnel protection on hydraulic and pneumatic presses, as well as materials handling equipment, molding machines, automotive assembly transfer lines, even people movers and amusement park rides. In this application, the safety catchers were needed to prevent gravity fall of the shutters in the event of hydraulic pressure loss, cylinder failure, control valve failure, or other system malfunctions. Two specially designed hydraulic release stainless steel safety catchers are employed on each of the shutters, which raise and lower via a central hydraulic lift cylinder with twin drive rods in parallel, connected by a bridge cross beam mechanism, also manufactured by AME for this application. In the "up" or closed position, the shutter is suspended by the drive rods. The safety catchers release with high-pressure (2200 psi) tap water, run through stainless steel hydraulic tubing, controlled by a central high-pressure pump and flow controls. Spring-loaded bases and prox switches to monitor the release and catch positions are also onboard the catchers. Because the safety catchers are recessed in solid steel shield blocks in their installation, all the hydraulic porting was specially engineered for topside access to enable easier installation and maintenance. Seals and elastomeric materials used on these safety catchers needed to be suitable for radiation exposure. All functionality test results and materials certifications were supplied to the strict requirements of ORNL. View of shutter top with bridge beam removed, showing the lift cylinder (center) and SITEMA Safety Catchers (left and right). Should the load begin to drop for any reason when there is no hydraulic release pressure, the self-intensifying locking mechanism in the safety catcher engages the load and secures it until the load direction is reversed and the pressure is restored. Simply restoring the release pressure will not release the load, Davis notes. Water is used for this hydraulic system, as it's inert and not susceptible to radiation damage or pose a flammability hazard. The tap water used here is constantly filtered and sterilized as it runs through sanitary-grade, Schedule 80 and XXS stainless steel piping. 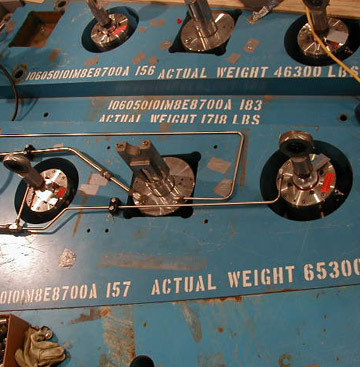 Separate hydraulic control manifolds are present, so that each instrument operates independently. Likewise, each lift cylinder has its own leak detection system.